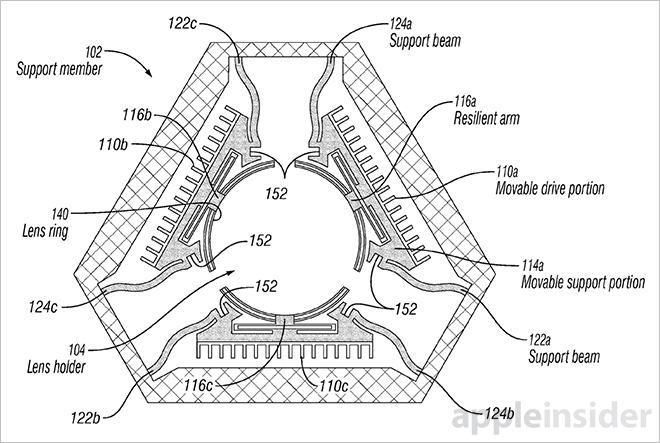 While current iOS devices employ traditional voice coil motors for camera autofocusing duties, Apple is looking into a unique MEMS solution that could lead to much slimmer and more power-efficient handset designs. 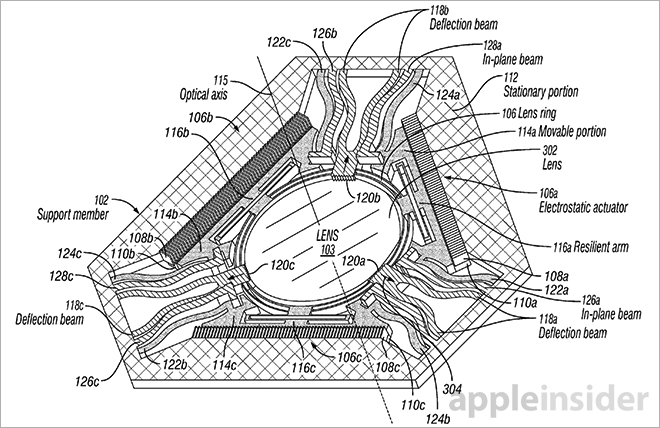 The U.S. Patent and Trademark Office on Tuesday granted Apple U.S. Patent No. 8,711,495 for a "MEMS autofocus actuator," which details a novel implementation of micro-level machinery to shrink down a miniature camera's lens package. 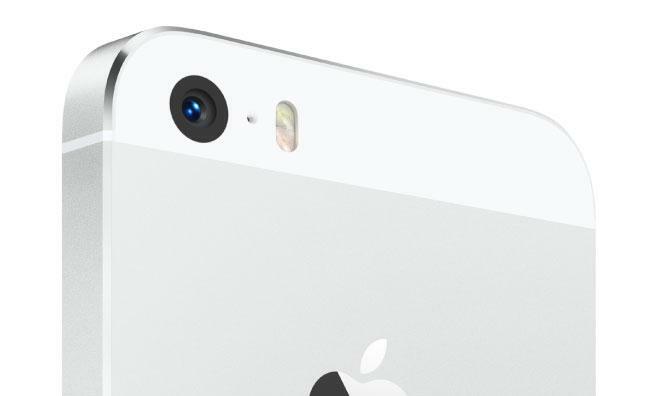 As noted by Apple, many current devices rely on the voice coil motor (VCM) to drive autofocus systems in small camera arrays like those seen in the iPhone. Despite drawbacks like relative high power consumption and low force yields, VCM has remained the predominant actuator tech due to its robust and simple design. Other actuation methods have been tested, Apple says, including micro-electro-mechanical systems (MEMS), though until recently the state of the art was not mature enough for mass deployment. In comparison to VCM, however, silicon MEMS tech based on the electrostatic comb drive is faster, more power-efficient and, when designed correctly, cheaper. Interestingly, the main draw of being vastly smaller than traditional actuators has kept MEMS solutions from becoming commercially viable products. The mechanisms are delicate and require designs that are difficult to manufacture. 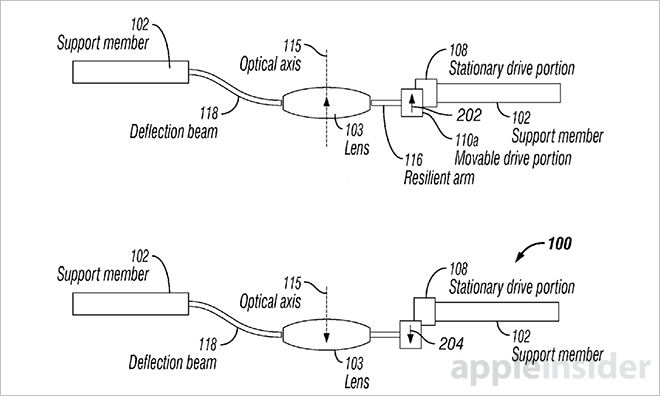 Apple's invention looks to solve the two major issues by introducing a deflection beam integrally attached to a lens element and an electrostatic actuator. The entire package can be manufactured from a silicon wafer to become a single integrally formed structure. The method starts with a support member, as seen above, that can be mounted either as part of the host device or within the camera module itself. A central lens holder or lens element is attached between a deflection beam and a "resilient arm" that is largely stationary in respect to the lens. To move the lens, an electrostatic actuator is employed which in one embodiment consists of a comb drive with interlocking fingers. When a voltage is applied to the actuator, a movable drive member connected to the lens and suspended in front of a stationary drive member is displaced. The movable member travels parallel to the lens stack and sensor beneath, that is up and down along the optical axis, through a deflection beam or beams that extend radially inward from the support member. When a force is applied, such as loading a lens being inserting into the lens holder, the beams are forced outward and buckle to create a bi-stable configuration. Under force of the buckled beams, voltages applied to the actuator create electrostatic forces that pull and push the movable drive member toward and away from the stationary drive member. The document notes this buckling is integral to operation and must be maintained through retaining arms or careful application of system power. Other embodiments describe a lens ring and alternative deflection beam configurations, as well as tilting of the lens within the lens ring. Further measurements and specifications are also described in greater detail. It is unclear if Apple will incorporate the invention in an upcoming iOS product, though MEMS technology would be a good fit for the company's ever-shrinking handset and tablet designs. Competing smartphone makers have been rumored to be incorporating similar MEMS focusing technologies into their products, a notable example being Oppo's upcoming Find 7. In January, however, Oppo's rumored MEMS actuator supplier DigitalOptics said manufacturing of its "mems|cam" would cease as the company undergoes restructuring. 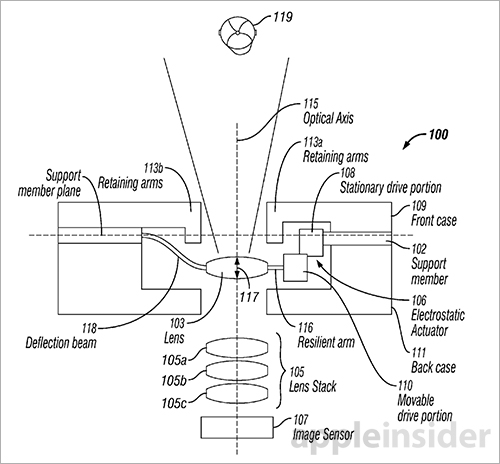 Apple's MEMS autofocus actuator patent was first filed for in October 2012 and credits Richard J. Topliss as its inventor.